March was a dizzyingly busy month for Twin Cities progressives, and it’s going to get even more intense in April and May. Even though admittedly the DFL cannot always claim to be progressive, still a lot of progressive folk can be found there, especially in March when a majority of the DFL Senate District/House District conventions take place. Our Revolution, both MN and TC, have not been as vocal as usual for the past couple of months, but their silent presence was felt at the conventions. In my own SD 63, for instance, while no one at the convention publicly identified as Our Revolution, I know a lot of the people who were new two years ago came in on the Bernie Sanders wave. A popular slate of two young DFLers was elected to lead SD63—Amanda Madison (Berniecrat activist) as chair, and Isaac Russell (MN Senate aide and Humphrey Institute grad student) as vice chair. While our corps of 32 delegates and 32 alternates to the state convention only included four people of color (one a Twin Cities DSA comrade! ), that’s still a slight improvement over past delegations. SD 62 just to our west and north had an extremely contentious battle for endorsement in 62A, where Karen Clark is retiring and many new and determined candidates were vying, most of them young or POC or both. In 62B, where Susan Allen is retiring from the House, the popular and undoubtedly progressive Aisha Gomez won the endorsement. The A side recessed with no endorsement, then a quorum check caused the SD to be adjourned with no state delegates chosen. A committee formed to schedule the reconvening for April 7, but did not plan for a 62A convention, just for delegate selection. Of course that could change when they actually meet, so watch this space. Speaking of the DFL, a comrade recently remarked on the indecent speed with which our new mayor on the west side of the river has descended from a faux progressive with some great promises to a blatant crony-ist with no apparent memory of any promises. I think the people of Saint Paul on the whole are a lot happier with their choice. Around about Super Bowl time (gosh, remember that? it seems like a year ago) we learned that Minneapolis City Attorney Susan Segal had accepted a free executive suite at the US Bank stadium. Well, why not? She certainly earned it, and it’s not like the Wilfs could just pay her attorney fees and let her choose her own perk. Mayor Frey re-appointed Segal as city attorney, and after some initial posturing and kerfuffle, she was confirmed 10 to 1 by the new and improved City Council. Andrea Jenkins and Lisa Bender were absent. To be fair, Segal was good on RCV, enforcement of new sick and safe leave laws, and the city pensions crisis, among other things. Perhaps the scandal of the Vikings stadium is not as important to all constituents in the city as we in the southside bubble had assumed? Only the Green Party’s Cam Gordon voted No. Centro de Trabajadores Unidos en Lucha, CTUL (pronounce it say-tool), held its annual pancake breakfast on March 11. We attended and it was packed solid. Over $46,000.00 was raised from around 500 supporters to continue paying for their “new” space on Chicago Avenue and continue organizing lower-waged workers for better lives. Projects for 2018 include organizing casual and semi-skilled construction workers (frequent victims of wage theft); contributing to the fight for $15 in Saint Paul; a second Leadership Institute to train low-wage and immigrant workers to organize themselves; and an arts program. • April 3 – still time to participate if you’re reading this on April 2! – Health Justice Now! A forum on health care for all, featuring Rose Roach of the MN Nurses Association; Bruce Thao, MN DoH Center for Health Equity; and a DSA speaker tbd. At 7 p.m., Living Spirit UMC, 4501 Bloomington Ave S.
• There is a Stomp out Slumlords campaign soon to be debuted by the Housing Justice Branch. This branch is also working in solidarity with Defend Glendale & Public Housing Coalition. • Mindful of areas where we have not been as closely involved, but have the will to be, efforts are underway to start branches or working groups on racial justice, anti-war/anti-imperialism, and religious socialism. • TCDSA had about 30 members participate in the MayDay Festival last year. We are intensely planning for this year (May 6, all day, Powderhorn Park) and hope to double last year’s number. Come and see us at our table! 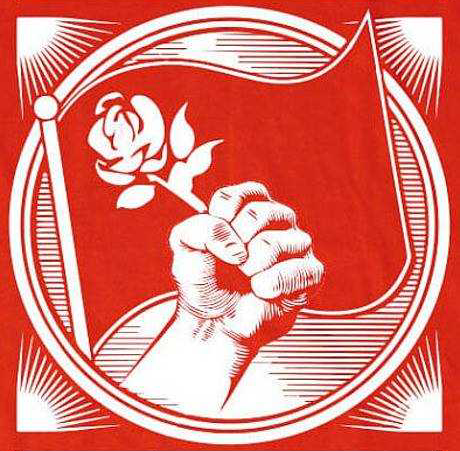 • About a dozen TCDSA members are delegates to the Minneapolis City Convention, May 12, and TCDSA will have an information table. • Transition Longfellow is hosting the movie “Growthbusters,” Friday, April 13, at 6:30 p.m. at Walker Community Church. • There will be an anti-war protest sponsored by MN Peace Action Coalition and two other groups, April 15, 1:30 p.m., corner of Hennepin and Lagoon in Minneapolis. • A group called Mutual Aid Disaster Relief will be in town with a three-day workshop starting May 2. The first presentation, co-presented by North Star Health Collective, is at 5 p.m.— “Protectors v. Profiteers: Communities in Resistance to Disaster Capitalism,” also at Walker Church.